Glideaway’s pop-up trundle unit is constructed with your loved one’s safety in mind. Gravity locks prevent inadvertent release, while specially designed tension spring tabs help to lock the activation bar securely in place. Height: 15″ elevated; 5″ collapsed. 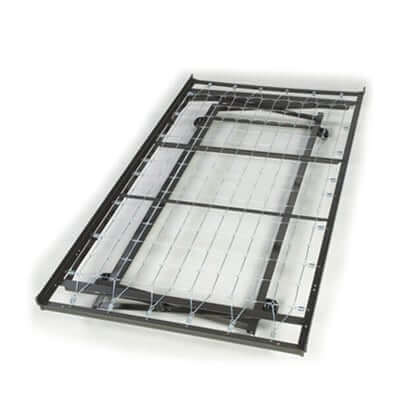 Measurements: 39″ x 72″ angle iron construction built to last and safety. Sides rails help to retain mattress and keep it from sliding out of position. Spring-loaded activation safety bar assures that bar is locked in position and also makes closing and lifting operation a snap. This unit is a Pop-Up Trundle with tension springs for Daybeds that is stored under your daybed when not in use. This Pop-Up trundle provides for easy lifting and closing so that you can turn any day bed into an additional twin-sized bed by adding a mattress along with a pop up trundle unit. (mattress sold separately).